This stylish and luxurious Barcelona apartment is located in the centre of the city, where you will find some of the best eateries and bars around. 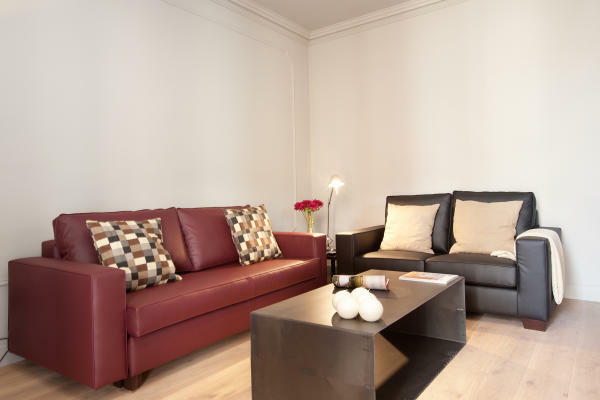 Located just a short walk from Las Ramblas, Plaça Catalunya and the grand Passeig de Gràcia street, this Barcelona apartment is in an ideal location for those who wish to experience the very best of Barcelona. You will also find some of the city’s top attractions such as Gaudí’s La Pedrera and Casa Batlló easily reachable from the apartment. Lavishly designed with a pop of colour, this apartment can comfortably sleep up to 6 guests, making it the ideal place for a large family or group of friends. There are a total of 3 bedrooms and 2 bathrooms in this apartment. This apartment also includes a spacious private terrace, ideal for making the most of the Spanish weather. You can prepare your favourite home cooked meals in the fully equipped, state-of-the-art kitchen. There is also a dishwasher and a washing machine for your convenience. Complete with an Internet connection, air conditioning and central heating, this apartment is the perfect place to stay in Barcelona at any time of the year. Located on the ground floor of this recently renovated apartment building you will find a 24 hour experienced concierge service, should you have any inquiries, or need any tips or assistance. There is also a 150m2 communal terrace, complete with comfortable sun loungers, and security cameras are installed throughout the building to ensure you feel completely at ease during your stay.